You'd rather be on the couch cozied up, but wearing these is the next best thing. 1. A longline leopard print cardigan so you can truly become the cat's meow. 2. Stylish joggers with all the comfort of sweatpants, but that are cute enough to inspire a fashion blogger–style Instagram while running errands. 3. A pair of 100% opaque, fleece-lined tights you can layer under your skirts and dresses (or even under pants on a really chilly day) without losing your stylish look. Get them from Amazon for $17.99 (available in two sizes, black and navy; you can also get two pairs for $29.99). 4. A fleecy dress (with pockets!) to combine the comfort of sweatpants with the best part of wearing a dress: not having to put an outfit together. Get it from Amazon for $16.99 (available in sizes S–XXL and 26 colors, both crew- and v-neck). 5. A faux sheepskin coat so snuggly, you won't even feel ~sheepish~ about wearing it every day. Get it from Forever 21 for $38 (available in sizes 1X–3X and three colors). 6. A v-neck sweater made from a chenille knit that feels like 👏 woven 👏 velvet 👏. Can I get an amen? Get it from Urban Outfitters for $59 (available in sizes XS–XL and six colors). 7. A deceptively warm zip-up fleece with patch pockets that are both stylish and convenient. Get it from Amazon for $49.52+ (available in sizes XS–XL and five colors). 8. Waffle-knit thermal leggings, because cozy sweater fabric shouldn't just be for your torso. Get them from Free People for $38 (available in sizes XS–L and four colors). 9. A pair of fluffy-lined leggings so soft, you'll feel like you might be wearing actual clouds. 10. An incredibly cuddly oversized teddy jacket you'll want to wear lit'rally every day this fall. Staying warm AND fashionable? Dreams really do come true. Get it from Amazon for $29.99+ (available in sizes S–3XL and 10 colors). 11. Mid-rise jeans with a *fleece lining* and stretchy fit so toasty warm and comfy, you might forget you're even wearing pants. Get them from Express for $47.94 (available in sizes 00–18, short, regular, and long, and a light wash here). 12. A velvet chenille dress that'll look equally fabulous over leggings, tights, or over-the-knee boots for softness + warmth. 13. 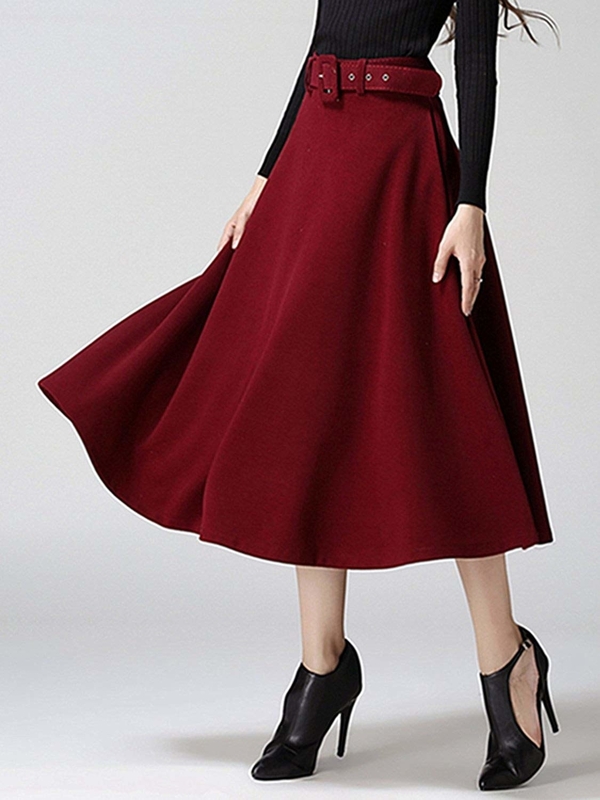 A woolen midi skirt with a matching belt for a vintage-chic outfit straight off a Nancy Drew mystery cover — basically you've already solved The Mystery of the Stylish-But-Toasty Outfit. And it ALSO has pockets. 14. A vintage-y chevron half-zip for après-ski vibes far away from the bunny slope. Get it from Tillys for $24.99 (available in XS–XL and two colors). 15. Luxe velvet leggings that'll add a serious dose of winter glam to every outfit you put together. Get them from Amazon for $18.99+ (available in sizes XS–5X and 16 colors, both plush and crushed velvet). 16. A pearl-studded shift made out of a sweatshirtlike fleece to keep you warm. Good luck not reaching for this every single day. Get it from Lane Bryant for $33.59 (originally $47.99; available in sizes 14/16–26/28). 17. A slouchy sweater with patched elbows you'll want to ~pet~ all afternoon. You know, while stretched out on the couch and preparing for a ~cat~ nap. 18. A multi-pack of fleece-lined leggings in a wide range of colors you can wear with each of your favorite sweaters. Get the pack of three pairs from Amazon for $17.99 or a pack of six pairs for $32.99 (one size fits most). 19. A faux shearling and faux suede vest that just might get you votes ~vest dressed~. Get it from Nordstrom Rack for $19.97 (available in sizes XS–XL, regular and petite and five colors). 20. A velvet duster with a ruffled hem so you can sweep dramatically in and out of rooms — without the restricted-arm feeling you get with regular jackets. Promising review: "I wore this to several different Christmas parties and received so many compliments. So soft and comfortable. I found myself touching myself a lot to feel the velvet. I would buy this in every color if I could justify the need." —Kris F.
21. A twist-back sweater for when you're torn between going out with your friends and staying home in your PJs. This is the best of both worlds! Get it from Dynamite for $49.95 (available in sizes XS–XL). 22. A soft 'n cozy knit blazer, because you want the look of a jacket, but without the feeling of being trapped in an arm prison. Get it from Madewell for $129.99 (originally $158). 23. An oversized sweater in a soft thermal knit that'll never feel itchy at all. Get it from Urban Outfitters for $44 (available in sizes XS–L and eight colors). 24. A faux fur leopard coat so you can make the most out of the best trends of 2018 — without *spending* the most. 25. A balloon-sleeve pullover sweater, because even though the mercury is dropping, your personal style is just heating up. 26. A chicly oversized parka that'll keep you warm — and make everyone think your splurged big time. Mega style and mega warmth for under $100? Sign me up. 27. Buffalo plaid sweater leggings with a drawstring waist and thicker material perfect for binge-watching Hallmark holiday movies, wearing out to dinner under an oversized blouse or sweater, and yes, even sleeping in. Get them from American Eagle for $39.95 (available in sizes XXS–XXL). 28. A just-off-the-shoulder-enough sweater so you don't have to keep yanking it up your collar to stay put — aka you can warm your hands on your piping hot peppermint mocha instead. Get it from Amazon for $36.99 (available in sizes S–XL and four colors). 29. An oversized grid-print turtleneck for anyone into minimalist dressing, but a maximal number of sweaters in their closet. 30. 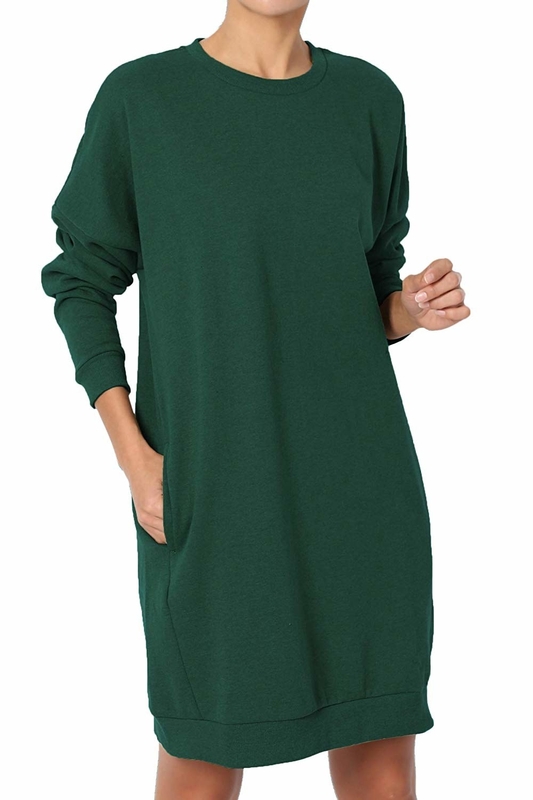 A perfectly oversized sweater you'll wear so much, your friends might get a little concerned. "...You're wearing that AGAIN?!" "This sweater is my home now." The cable knit makes it look profesh and put together, and the little vents on both sides are just too cute. Just add your fave leggings! Get it from Amazon for $22.99+ (available in sizes S–XXL and 12 colors and styles). 31. A sherpa coat to wear when you're feeling (color)blocked when it comes to getting dressed. This looks great over anything. Get it from J. Crew for $298 available in sizes XXS–XXL). 32. 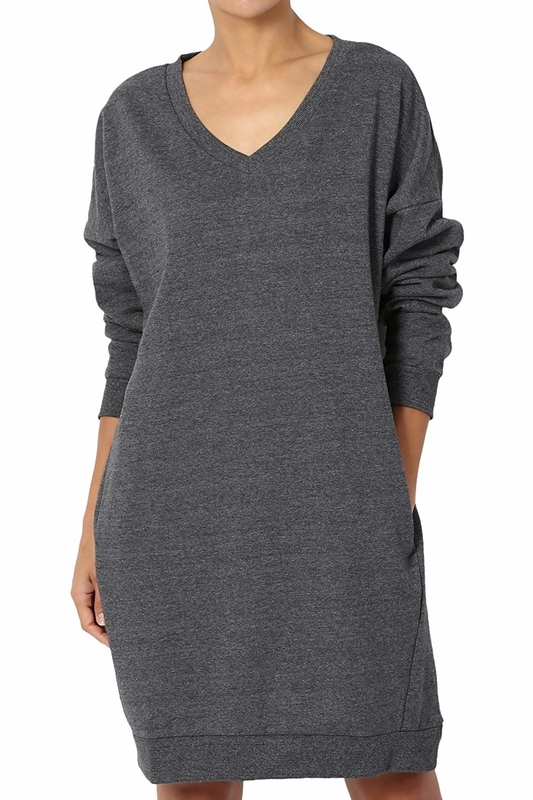 A ribbed knit swing dress with pockets that'll double as lil' hand warmers on brisk strolls. 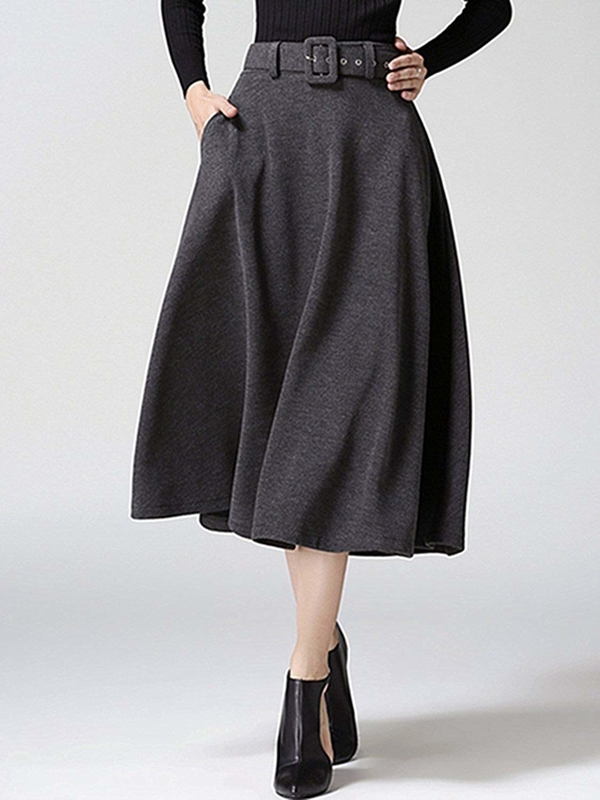 Get it from ModCloth for $69 (available in sizes S–3X). 33. A classic and super-soft flannel shirt to dress down a fancy skirt or just pair with jeans and leggings. Get it from Amazon for $27.89 (available in sizes M–5X and 14 colors). 34. A reversible wrap cardigan that'll honestly be the closest thing to just wearing an actual blanket in public. 35. A sweater dress with three-tiered ruffled sleeves, because why should cakes have all the fun? Get it from Amazon for $16.99 (available in sizes S–XXL). 36. A dogs-dressed-in-knitwear crewneck, because I don't know if there's anything more cozy than a sweater-ception like this. Get it from J. Crew Factory for $49.50 (available in sizes XXS–3X). 37. And a classic fitted turtleneck you'll buy in all 16 colors, that's how perfect it is. This bb has over 800 five-star reviews! If you have a long torso, this sweater is perfect for you, and if you're petite, it can totally work as a sweater dress, too. Get it from Amazon for $21.88+ (available in sizes 0-4–18-22). Here's to looking cute *and* staying warm this winter!